no corresponding convolutions appear. The organs of Benevolence and Imitation, however, which are here classed among the superior sentiments, run longitudinally, and corresponding parts are found in the brains of the lower animals. In judging of the size of the organs of the superior sentiments, the elevation of the head above the organs of Causality and Cautiousness should always be first observed. THIS organ is situated at the upper part of the frontal bone, in the coronal aspect, and immediately before the fontanel. 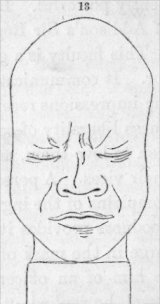 When it is large, the frontal bone rises with an arched appearance, above the organ of Comparison ; when small, the forehead is low and retreating. The following cuts exhibit a contrast in this respect ; the skull of Burns being elevated far above the eyes, while that of Griffiths (a murderer) is low and narrow in front. The figures of Gottfried and Eustache, on p. 142, may likewise be compared at this organ. seen him manifest, on all occasions, only benevolence, and sweetness of disposition. This is the more surprising, as he does not possess the advantages of education, and has grown up to manhood among servants of very inferior habits." Dr Gall adds, that, previously to that time, he had been far from supposing that what is called goodness of heart could have any organ in the brain, and, consequently, had never looked for indications of it in the head. The repeated solicitations of his friend, however, at length awakened his curiosity. He immediately recollected the habitual conduct of a young man whom he had known from his most tender infancy, and who was distinguished from his numerous brothers and sisters by his goodness of heart. Although he was passionately fond of the games proper to his age, and delighted in scouring the forests in search of birds' nests, yet no sooner did any of his brothers or sisters become sick, than an inclination still more powerful kept him at home, and drew from him the most assiduous attentions towards the sufferer. When grapes, or apples, or cherries, were distributed among the children, his share was always the least, and he rejoiced in seeing the others partake more largely than himself. He was never more pleased than when some good fortune happened to those whom he loved, on which occasions he often shed tears of joy. He was fond of taking charge of sheep, dogs, rabbits, pigeons, and birds ; and if one of these birds happened to die, he wept bitterly, which did not fail to draw upon him the ridicule of his companions. Up to the present time, continues Dr Gall, benevolence and goodness are the distinguishing characteristics of this individual. These dispositions certainly did not arise from education ; on the contrary, he had been all along surrounded by those whose conduct was calculated to produce the very opposite results. Dr Gall then began to suspect, that what is called goodness of heart is not an acquired, but an innate, quality of the mind. On another occasion, amidst a very large family, he spoke of the boasted goodness of heart of the servant Joseph. "Ah!" said the eldest daughter, "our brother Charles is exactly like him ; you must positively examine his head-I cannot tell you how good a child he is." "I had thus in my eye," says Dr Gall, "three cases, in which goodness of disposition was strongly marked. I took casts of the heads, placed them beside each other, and continued to examine them until I should discover a development common to the three. This I at last found, although the heads were in other respects very differently formed. In the mean time, I tried to find similar cases in families, schools, &c., that I might be in a condition to multiply and correct my observations. I extended my investigations to animals also, and, in a short time, collected so great a number of facts, that there is no fundamental quality, or faculty, whose existence and organ are better established than those of Benevolence." stance of the disposition formed by Benevolence when eminently powerful. It is a leading feature also in the character of Addison's Sir Roger de Coverley. 1 Journal de Id Soc. Phrén. de Paris for 1834, and April 1835; also Phren. Jour, ix, 134; and Vimont's Treatise on Phrenology. and the temper is then apt to become cold, harsh, sour, and unhappy. There is little sympathy with enjoyment ; the face of creation does not appear to smile ; moral and physical objects are viewed on their darkest sides ; and if Destructiveness be large, the mind steels itself with malignity, as a defence against their imagined evil qualities-misanthropy, in short, is the result. The character of Lucifer, as drawn by Milton, and by Byron in his drama of Cain, is a personification of great Destructiveness and Intellect, with an utter destitution of Benevolence. The organ is small in tribes of men remarkable for cruelty ; for example, in the Caribs. In the representations of Tiberius, Caligula, Caracalla, Nero, Catherine of Medicis, Christian the Cruel, Danton, and Robespierre, says Dr Gall, the organ is deficient ; while it is large in Trajan, Marcus Aurelius, Henri Quatre, and other individuals distinguished for benevolent feeling. vivid compassion for every object in distress, should consider, that this impulse is not the voice of inspiration directing him. to the mode in which it should be indulged. On the contrary, the stronger the emotion, the power of direction is not unfrequently the weaker ; because the feeling is in itself of so excellent a character, and so delightful, that the man who is inspired by it is the last to suspect the necessity of much consideration in regard to the mode in which it is employed. On the other hand, however, it must also be remembered, that the faculties which reason do not feel Benevolence, and that, hence, that individual is most fitted to mature wise plans of charity, who enjoys a large endowment of this sentiment, combined with powerful intellectual faculties duly cultivated. In these two princely boys ! And make him stoop to the vale." much Combativeness and Destructivness, combined with great Benevolence. The skull of Burns indicates large Combativeness, Destructiveness, and Self-Esteem, combined with large Benevolence and full Conscientiousness ; and Dr Currie, his accomplished biographer, describes his character thus : " By nature kind, brave, sincere, and in a singular degree compassionate, he was, on the other hand, proud, irascible, and vindictive ;" indicating, in the clearest manner, the co-existence in him of the organs before named. 1 Lord Kames mentions several instances of the combined action of Destructiveness and Benevolence in his Sketches, B. I. Sk. 5, See also Phren. Journ. i. 192; ix. 67, 417.
others, she will neither sympathize with, nor spontaneously labour to assuage, the patient's pain. This observation applies to every department of life in which Benevolence can be manifested. When it is small, the well-spring of goodness flowing towards misery is absent. Dr Vimont mentions that he has seen persons become unwell just before witnessing the operation of blood-letting ; but he is convinced that this does not arise from the action of Benevolence, but from an affection of the propensity to self-preservation, one effect of which, when painfully excited, is to produce a trouble which suspends the circulation. He has not observed that these persons were, on this account, more soft, more generous, in short more benevolent, than others. I have observed several individuals who were liable to faint on seeing blood flowing, and remarked that Benevolence was large in their heads, and Destructiveness small or moderate. Dr Spurzheim dissents from this view, and holds Conscientiousness to be a distinct sentiment, of which he has discovered and established the organ ; although it was not admitted by Dr Gall. There are only two ways of settling this dispute ; the one by metaphysical analysis of the feeling, and the other by observation of the organ. The result of both appears to me to be in favour of Dr Spurzheim. Dr Vimont also agrees with Dr Spurzheim on this point.- I shall revert to the subject when treating of the organ of Conscientiousness. 1 Sur les Fonctions du Cerveau, tome v. p. 273, et sequen. head of the Tiger, says he, is more flat at this part than that of the lion ; and the heads of the hyaena and wolf are more depressed than that of the dog. The organ is greatly depressed immediately above the level of the eyes, in the baboon ; while, on the contrary, it is elevated in the ouran-outang ; and the dispositions of all these animals are in accordance with their development. In the horse the organ is placed in the middle of the forehead, a little above the eyes. When this region is hollow and narrow, a horse is invariably vicious, and disposed to bite and to kick. In mild and good-natured horses, on the contrary, this part stands as far out as the eyes, or even farther. The driver of a cabriolet of Neuilly, says Dr Gall, bought, at a low price, a horse which nobody could use on account of its extremely bad temper ; but it was an excellent runner. In the first week it bit off two of the driver's fingers, and one of his ears. He attempted to correct it by redoubled blows, but these rendered it only more vicious. He then resolved to try the effect of gentle treatment, and this succeeded to a certain extent. The organ in question was very small in this animal ; and the same conformation will be found in all horses which require to be muzzled, to prevent them from biting. On one occasion, a gentleman in the country mentioned at his dinner-table, that he had two horses, one extremely mild, and the other very vicious in temper. They were brought out into the stable-yard, and, by examining their heads according to Dr Gall's directions, I pointed out each, without having previously seen them. The difference was so great, that several persons who were present recognised it the moment they were told where to look for it. I have seen this experiment repeated with invariable success. gled till it was put down. Scarcely were they fifteen days old, when one indicated, by the motions of its tail, contentment and gentleness, not only towards other little dogs, but to persons who approached it ; the other, on the contrary, never ceased to grumble, and to bite every one within its reach. Aware how much was attributed to education, Dr Gall charged those who habitually approached these animals to bestow equal caresses on each. He himself took the greatest pains to soften the disposition of the ill-natured one ; but nothing could change its character. It bit even its mother, if she chanced to incommode it. In the sixth month, the dogs were seized with distemper, and with whatever degree of gentleness they were treated, the one never ceased to growl and bite, till death put an end to its efforts ; while the other, on the contrary, till its last moment, gave the most striking marks of attachment and gratitude to those who took charge of it. Even the servants were forcibly struck with the difference in the dispositions of these animals. Dr Gall states, that the difference in their heads was equally conspicuous. 1 Sur les Fonctions du Cerveau, tome v. p. 327.
troop ceased.' " Dr Poole also stated to me, that a cat having seized a young sparrow, a flock of these birds perceiving it, attacked the cat, fastened on its back, pecked and flapped till they made it quit its prey, and rescued the intended victim. This happened in a garden behind St John Street, Edinburgh, and was witnessed by a neighbour of Dr Poole's, who communicated the circumstances to him. Dogs also are known to precipitate themselves into water, to save persons in danger of being drowned ; and they attack with fury assassins who assail their masters. I have mentioned before, that stimulating liquors, by exciting the organs, give energy to the feelings or propensities which depend on them for the means of manifestation. Some individuals become excessively profuse when intoxicated. They would then give the world away ; or if they had the power, they would create a new one, in which every individual should enjoy infinite happiness. On the principle that intoxication can never create any feeling, I am inclined to think that such persons have naturally a large endowment of Benevolence, the organ of which is stimulated to this great activity by strong potations. This, however, is only a conjecture.
' See Phren Journ. vi. 120, 428.
developed. Idiots in whom this organ is large, are good-natured and harmless ; while those in whom it is small, if Destructiveness be large, are mischievous and wicked.
" I once knew a man, says Dr Benjamin Rush, who discovered no one mark of reason, who possessed the moral sense or faculty in so high a degree, that he spent his whole life in acts of benevolence. He was not only inoffensive (which is not always the case with idiots), but he was kind and affectionate to every body. He had no ideas of time, but what were suggested to him by the returns of the stated periods for public worship, in which he appeared to take great delight. He spent several hours of every day, in devotion, in which he was so careful to be private, that he was once found in the most improbable place in the world for that purpose, viz., in an oven. "-An Enquiry into the Influence of Physical Causes upon the Moral Faculty.-Philadelphia, 1786, p. 8. The existence of Benevolence, as an innate sentiment of the human mind, is distinctly recognised by Lord Bacon in one of his Essays. " I take goodness, " says he, " in this sense, the affecting of the weal of men, which is what the Grecians call philanthropia ; and the word humanity (as it is used) is a little too light to express it. Goodness I call the habit, and goodness of nature the inclination. This, of all virtues and dignities of the mind, is the greatest, being the character of the Deity ; and, without it, man is a busy, mischievous, wretched thing, no better than a kind of vermin. The inclination to goodness is imprinted deeply in the nature of man, insomuch that if it issue not towards men, it will take unto other living creatures ; as it is seen in the Turks, a cruel people, who, nevertheless, are kind to beasts, give alms to dogs and birds ; insomuch that, as Busbechius reporteth, a Christian boy in Constantinople had like to have been stoned for gagging, in a waggishness, a long-billed fowl." Mr Robert Cox has published, in the tenth volume of The Phrenological Journal, p. 1., an elaborate essay on " the laws of action of Benevolence ;" in which he adduces a variety of facts and arguments to shew that the power and activity of this organ are increased by the agreeable or pleasurable action of the organs of the other mental powers, in the same way as destructiveness receives excitement when their action is disagreeable. Hence he regards happiness as conducive to generosity and sweetness of temper, and misery as tending to render the disposition sour and irritable ; and from these principles practical results of great importance are deduced. The organ is regarded as established. 1 Lecture 59, vol. iii. p. 241.